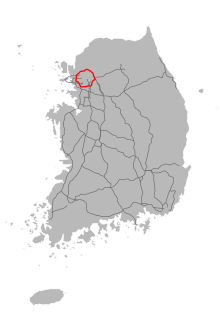 The Seoul Capital Area (SCA), Sudogwon (Hangul: 수도권; Hanja: 首都圈; RR: Sudogwon; MR: Sudokwŏn, [sudoɡwʌn]) or Gyeonggi region (Hangul: 경기 지방; Hanja: 京畿地方; RR: Gyeonggi Jibang; MR: Kyŏnggi Jibang) is the metropolitan area of Seoul, Incheon, and Gyeonggi-do located in north-west South Korea. It has a population of 25 million (as of 2017) and is ranked as the fifth largest metropolitan area in the world. Its area is about 11,704 km2 (4,519 sq mi). It forms the cultural, commercial, financial, industrial, and residential center of South Korea. The largest city is Seoul, with a population of approximately 10 million people, followed by Incheon, with 3 million inhabitants. The Capital Area occupies a plain in the Han River valley. It contains some of the most fertile land on the Korean peninsula, although relatively little of it is now used for agriculture. The Gimpo Plain, one of the country's larger expanses of level arable land, covers much of the area of the cities of Gimpo and Bucheon. The Capital Area has been home to a Korean capital for around 2,000 years. Its central location and relatively gentle landscape have given it a central role in the country's affairs. The first capital to be constructed in the region was that of Baekje, one of the Three Kingdoms of Korea. The country's first capital was built in 19 BC and was named Wiryeseong. This is believed to have been constructed near the modern-day boundary of Seoul and Gwangju City. However, Baekje was unable to hold this territory, and surrendered the Han River valley to Goguryeo in the 5th century. The land was then taken over by Silla in the 6th century, at which point it came to play a critical role in helping Silla to establish ties with China. After the fall of Silla, Taejo of Goryeo established the capital of his kingdom in Kaesŏng, now just north of the Demilitarized Zone. During the Mongol invasions of Korea in the 12th century, the seat of government briefly shifted to Ganghwa Island, now just south of the DMZ in Incheon metropolitan city, where the Mongol naval attacks were repelled for about a decade before the king voluntarily surrendered to stop the carnage the Mongols committed in the peninsula, in order to lure the king out. After the fall of Goryeo Dynasty in 1392, the newly founded Joseon Dynasty had its capital (then called Hanseong or Hanyang), less than 100 km (62 mi) south of the old dynasty's capital, Kaesŏng. Hanyang was chosen to be the new capital for mountains surrounding it making it safe from enemies, and for the Han River, separating the north and south parts of the city that let the trade business flourish. During the new dynasty's rule, extensive road systems, administrative buildings, royal palaces, and new ports were built, quickly attracting wealth from all over the kingdom. During the Korean Empire period, Hanseong's public transportation was improved with the installation of streetcars and manually drawn trolleys similar to taxis. Horse carriage systems similar to the ones in Europe were also established. Following the Japanese annexation of Korea in 1910, Hanseong was renamed Keijo (Gyeongseong) and served as colonial Korea's capital. Upon Korea's liberation from Japan in 1945, the former colonial capital was renamed Seoul and became capital of South Korea. In the Korean War (1950–1953), the Capital Area became the focus of battles so destructive that most of Seoul and the surrounding regions were eradicated. Seoul was especially hit hard, since it exchanged hands four times during the course of the war. During the latter half of the 20th century, the Capital Area began to rapidly develop as South Korea's economic wealth expanded. Population expanded fourfold since the Korean War. In 2001, the new Incheon International Airport took over all international flights to Seoul. Covering only about 12% of the country's area, the Seoul Capital Area is home to more than 48.2% of the national population, and is the world's fifth largest urban area. This percentage has risen steadily since the mid-20th century, and the trend is expected to continue. Currently more than half of the people who move from one region to another are moving to the capital area. By 2020, it is projected that more than 52% of South Korea's population will live within the area, or 26,310,000 people. However, the Seoul Capital Area reached 25,620,000 people by 2015, bringing the chance of reaching a population of 26.31 Million in less than 5 years. In 2016, Seoul Capital Area's gross regional product was ₩810,287 billion(US$698.2 billion), generating 49.5% of the country's total gdp. It is the fourth largest urban economy in the world after Tokyo, New York City and Los Angeles, and the region hosts headquarters of 59 Forbes Global 2000 companies. As the economy of Seoul Capital Area transformed to knowledge economy from the manufacturing-based economy of the 20th century, there are a number of high-tech business parks in Seoul Capital Area, such as Digital Media City and Pangyo Techno Valley. The South Korean government is now implementing a plan to create several centers for economic activities in the Capital Area. According to the plan, for example, Seoul is a 'Northeast Asia's Financial and Business Hub', and southwestern coast, with Incheon and Suwon, is 'International logistics and High-tech Industrial Belt'. The Seoul Capital Area is home to the most affluent and livable cities and apartments in Korea but there are significant discrepancies between cities and districts, particularly between those built in the older and newer generations. Newer areas with more modern and luxurious apartments and infrastructure are more expensive, along with proximity to Gangnam District, the commercial center of the region. 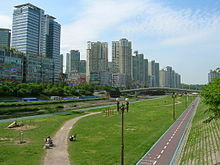 Development in the area is currently governed by the Capital Region Readjustment Planning Act (수도권정비계획법), first passed in 1982 and last revised in 1996. 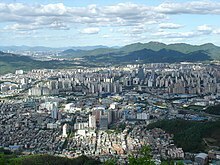 The Seoul Capital Area is divided among the special city of Seoul, the metropolitan city of Incheon, and province of Gyeonggi-do. Seoul has 25 gu (local government wards), Incheon has 8 gu and 2 counties, and Gyeonggi-do has 27 cities and 4 counties as the subdivisions. The 25 districts of Seoul. 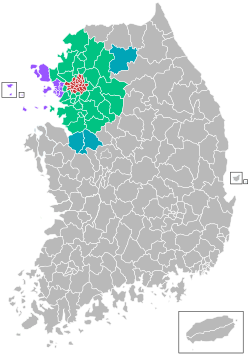 The 8 districts and 2 counties of Incheon. The 4 gu of Suwon (수원; 水原). The 3 gu of Goyang (고양; 高陽). The 3 gu of Yongin (용인; 龍仁). The 3 gu of Seongnam (성남; 城南). The 2 gu of Ansan (안산; 安山). The 2 gu of Anyang (안양; 安養). The cities of the capital area are tightly interconnected by road and rail. Many of the country's railroad lines, most notably the Gyeongbu Line, terminate in the region. 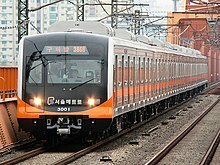 In addition, the needs for commuter rail are served by the Seoul Metropolitan Subway, which passes through Seoul, Incheon, and most of the outlying cities. The region is a nexus for travel by air and water. The country's two largest airports, Incheon International Airport and Gimpo International Airport, are in the metropolitan area. International and domestic ferries depart from Incheon's ferry terminals several times a day. Massive volumes of international freight pass through the container terminals of Incheon (primarily bound to and from China). Seoul Ring Expressway (Expressway No. 100) connects satellite cities around Seoul: Ilsan, Toegyewon, Hanam, Pyeongchon, Songnae, Bundang, Pangyo and Gimpo. ^ A government publication states that on 1 November 2010, the population of "Seoul Metropolitan Area" stood at 23,616 thousand, which is the sum of the figures given for Gyeonggi-do (11,270 thousand), Seoul (9,708 thousand) and Incheon (2,638 thousand), apparently including the periphery. Source: "Preliminary Results of the 2010 Population and Housing Census" (PDF). Statistics Korea. 21 January 2011. Retrieved 23 July 2011. ^ "통계청 - KOSIS 국가통계포털". kosis.kr. Archived from the original on 2016-04-03. ^ ""미군 잔류로 낙후된 동두천, 특별법 제정해야"". www.yonhapnews.co.kr. ^ Korea National Statistical Office (2008-07-22). e나라지표:수도권 인구 집중 현황 (in Korean). ^ Ryu Boseon (류보선) (2005-08-23). 수도권 인구 편중현상 계속 (in Korean). Korea National Statistical Office (KNSO) News. Archived from the original on 2007-09-28. ^ Hong, Yong-deok (홍용덕) (2005-06-01). 각종 분산정책 불구하고 수도권은 ‘인구 블랙홀’ (in Korean). The Hankyoreh.